This is the last little rose from our garden. I thought I would pick it to enjoy indoors as it cant really be seen outside. 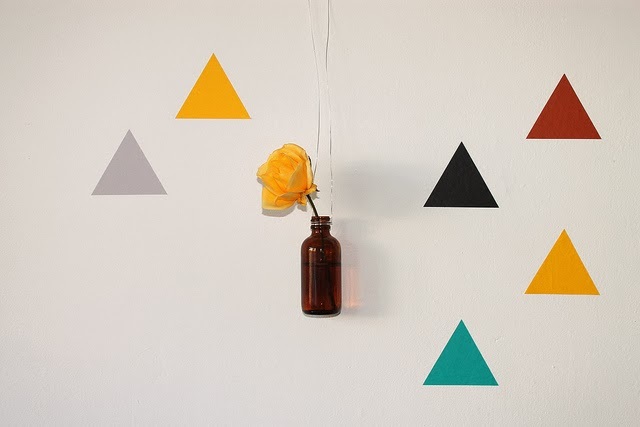 I made a little hanging vase by wrapping some thin wire around the neck of this bottle I saved and then pinned it on to the wall next to some triangle stickers. It makes a nice change from just putting it on the mantle like I normally would and it smells gorgeous too! I love the way you displayed the rose, that's very clever. what a lovely way to honor the last rose in the garden.